Kursk legacy: Will there ever be another massive tank battle? It's 70 years since Kursk, the largest tank battle in history. Will there ever be another battle involving thousands of tanks on each side or has armoured warfare had its day? Before dawn on 5 July 1943 explosions lit up the Russian sky and the earth shook to a huge bombardment. As the sun rose, waves of German panzers began rolling across fields of sunflowers and wheat. The greatest tank battle in history was underway. 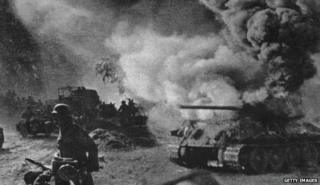 The Battle of Kursk pitted almost 3,000 German tanks against more than double that quantity of Soviet heavy armour. Hitler delayed the offensive - codenamed Operation Citadel - to wait for the arrival of the new Panther. It gave the Russians plenty of time to dig formidable defences and concentrate their own armoured units. Antony Beevor, author of The Second World War, describes the battle as a "slogging match". The German tanks were fewer in number but far superior in armour and firepower. Tigers and the "monster" Ferdinand tank destroyer went in first, attempting to blast their way through. The German high command was divided about Citadel. Erich von Manstein, attacking the southern shoulder of the salient, and Walther Model, attacking the northern, were deeply sceptical. Model argued that the operation's objective was so obvious that the Soviet high command had ample time to turn the salient into a massively fortified place d'armes from which they could launch a heavy armour counterblow. Hitler's misgivings led to Citadel's overlong gestation. This generated much signals traffic, which was intercepted by British code-breakers and passed on to Russia. Stalin presided over a battle-hardened Red Army capable of riding German armoured punches. By the time the Western Allies provided a further distraction with the invasion of Sicily on 10 July, the battle had already been lost. The Soviet counteroffensive - Kutuzov - was launched two days later. It was the death of Blitzkrieg. One SS tank commander destroyed 22 Soviet tanks in under an hour, Beevor says. But the Russians defended with "suicidal bravery", getting in close to throw mines under the caterpillar tracks. After eight days the German attack had run out of steam. Stalin launched counteroffensives that over the following six weeks inflicted a crushing defeat on the Wehrmacht. Kursk was a tipping point for the panzers, says Beevor. For the first time the Russian air force had "got its act together". Air power was emerging as a dominant factor, as became clear in Normandy the following year. Allied air superiority meant that the German panzers had to hide in the forests during daylight hours. The tank, like the battleship, was suddenly a sitting duck without control of the skies. But unlike the battleship, the tank remains a key part of most militaries. According to the International Institute for Strategic Studies there are 60,000 tanks in active service worldwide. During the Cold War, thousands of tanks were based close to West and East Germany as a potential invading or defensive force for a battle on the north European plain. "There's no question tanks would have been one of the foremost instruments in an invasion or defence," says Michael Codner, director of military sciences at the Royal United Services Institute. When the Soviets crushed the Hungarian uprising in 1956 they did so by sending hundreds of tanks into Budapest. The Yom Kippur War in 1973, when Egypt and Syria attacked Israeli forces, involved over 3,000 tanks. US and UK forces used them to liberate Kuwait in 1991 and invade Iraq in 2003. At the Battle of Fallujah, US Marines brought in extra armoured brigades to help in the street fighting. But tank offensives are usually limited to flat areas like desert, plain or steppe. In the jungles of Vietnam and the mountains of Afghanistan, the helicopter has proved itself to be a far more useful weapon. 1917 Battle of Cambrai - One of biggest early tank battles, fought between British and Germans. The British attempted to break through the Hindenburg Line. About 475 tanks were used and both sides lost about 45,000 soldiers. 1942 Second Battle of El Alamein - More than 1,000 Allied tanks fought 547 Axis counterparts, which saw the Germans effectively lose their battle for possession of Egypt and the much-prized Suez Canal. Tanks played a key role, with Allied forces receiving 300 Sherman tanks from the US. 1965 Battle of Chawinda - Part of the 1965 Indo-Pakistani War, the forces were fairly evenly matched, with the Indian Army commanding 225 tanks and the Pakistani Army controlling 282. The war ended after a UN resolution prompted an unconditional surrender from both sides. 1973 Battle of the Valley of Tears - The Yom Kippur War, between Israel and an Arab coalition led by Egypt and Syria, saw coalition forces march into Israeli territory. Tanks were central to their surprise attack in the Golan Heights. But the Syrians - with about 1,200 tanks to the Israelis' 100 - were unable to defeat them before retreating. 1991 Battle of 73 Easting - Decisive Gulf War victory for US and British forces in their Desert Storm operation in Iraq. The Iraqis lost more than 160 tanks. In the 1980s, the MoD commissioned a paper considering whether the UK should replace its tanks with helicopters, Codner recalls. In the end their use in supporting infantry in seizing territory was deemed too important. But the British Army has deployed none of its Challenger tanks to Afghanistan. The tank's importance is as much symbolic as tactical. It can be used for good or ill. Faced by the 1989 student protest at Tiananmen Square the Chinese authorities deployed tanks. And Saddam Hussein used it as a "military status symbol", says Beevor. On the other hand, peacekeepers need tanks to face down bullies, he notes. "In Bosnia things only changed when the tanks went in. That's when the Serbs backed off." Nato has drastically cut its tank numbers since the end of the Cold War, says Christopher Foss, editor of Jane's Armoured Fighting Vehicles. Germany was host to 4,000 and Britain and France over 1,000 each at one time. Now they have cut back to a quarter or a third of those numbers. Earlier this year, the last US battle tanks left Europe. "Tankies" say heavy armoured vehicles have been written off many times before, only to be contradicted by events. At the end of the Cold War it was difficult to see a need for British tanks. Yet a year later the 7th Armoured Brigade was charging through the desert to liberate Kuwait, notes Beevor. In 2003, the Canadian government announced it was getting rid of its Leopard tanks. "We are losing a millstone that has hamstrung our thinking for years," Lt Gen Rick Hillier said. Yet the policy was later reversed and dozens of Leopard 2s have been acquired by the Canadian military. Today the UK has 334 tanks. A Ministry of Defence spokesman says the UK is still committed to heavy armour: "The 2010 Strategic Defence and Security Review (SDSR) recognised the need for an agile and capable force, which included the continued requirement for tanks to provide a unique capability." The UK's Challenger 2 tanks will be in service until roughly 2035, thanks to a "life extension programme", the spokesman adds. In 1915, Winston Churchill, then First Lord of the Admiralty, created a Landships Committee to tackle the problems of trench warfare. Little Willie was running by the end of 1915 but a new design was already under construction, which would become the prototype for British heavy tanks in WWI. Little Willie never saw combat, but it represented a major step forward in military technology. Lessons from this pilot project helped shape the vehicles that would supersede it. Outside Europe tanks numbers are rising, Foss says. In the Middle East, Saudi Arabia is upgrading its US-made M1 tanks, Qatar has opted for the Leopard 2. China is replacing its tanks, South Korea is self sufficient, India and Pakistan have large numbers already. Asian countries without a tradition of tanks are building up their forces. Singapore and Indonesia have opted for the Leopard 2, while Malaysia has ordered Polish tanks. Used properly - with infantry, engineers and close air support - they are still a crucial part of a military's capability, says former US tank officer Robert Forczyk, author of a forthcoming book about Kursk. "They provide the sharp point of the spear that can break through defences and advance rapidly to seize key objectives. Only airborne forces offer a similar versatility." Day and night vision equipment gives modern tanks a big advantage over their WWII equivalents. A Tiger tank's powerful gun could finish off one of today's light armoured vehicles. But it would be impotent against a modern battle tank, says Foss. "The Challenger would open fire before the Tiger even knew it was there, and penetrate its armour." But 70 years after Kursk, is a tank battle on that scale still possible? Undoubtedly, says Forczyk. Various countries that have fought in the past have massive tank numbers. India has 3,250 and Pakistan 2,400. In the Middle East, Egypt has 2,500 and Syria 3,000, while Israel (500 in active service, 2000 stored) has regularly used tanks in recent conflicts. Life and times of a "wonder weapon"
It's possible to "wargame" purely hypothetical conflicts. China has more than twice as many as any other nation at 7,450. Russia has 3,300. But the threat of a tank battle between North (3,500) and South Korea (2,500) is perhaps a more realistic possibility. In the battles of the future, the tanks may be unrecognisable from the Russian T34 and German Tiger that did battle at Kursk. Military technology has reached the point where unmanned tanks - a land drone - are now possible, says Codner. For traditional "tankies" it may be a different kind of beast altogether.